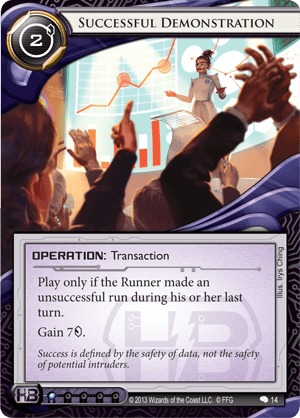 Play only if the Runner made an unsuccessful run during his or her last turn. Success is defined by the safety of data, not the safety of potential intruders. I love this card. I think it's great. It boggles my mind that it doesn't see much play. Look. Compare this to Restructure. Both cards give you a net gain of 5 credits. Only Restructure will fail you in those moments where you need it most. You will draw it with 2 credits in the bank and it will leave you in the stupid position of having to decide whether it's worth it clicking for credits the next 4 turns or keep drawing for cards for a Hedge Fund so you can afford playing Restructure. Or consider how you might get to 8 credits when suddenly the runner Indexes R&D. You could rez a Tollbooth but it would put you in such a financial hole, you won't be able to afford the Restructure. Not next turn and probably not for a lot of turns down the line. Most of us will let that Indexing through to have a chance to keep rezing thing late game. Here is where Successful Demonstration comes in. It is good for the same reasons Desperado is good: It rewards you for doing what you want to do anyway - stopping runners. It says - "Go ahead, rez that Tollbooth" It says - "Go ahead, put 5 credits into that Caduceus trace". Yes, it's probably less great if you are going for some kind of Midseasons or Scorched Earth win, where you kinda want runners to do successful runs. Although with Weyland BABW, you would get 6 credits instead of 5 since this is a Transaction. And as the cherry on top, there is the psychological aspect - when the runner crushingly realizes they really should have clicked through that Eli as you play 2 Successful Demonstrations gaining a whopping 10 credits with a grin on your face from here to midway station. Make no mistakes. This is an EXCELLENT card. It is very playable and it is a ton of fun.